“I am alive! 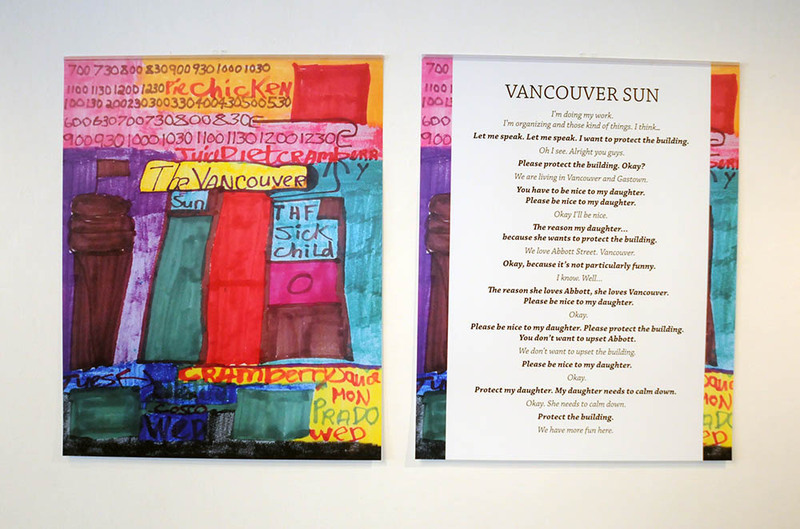 I am reborn in Gastown!” says author and artist Teresa Pocock. Teresa is defying the “health care system” that wrongly labelled her “incapable” two years ago when she lived in Ontario. 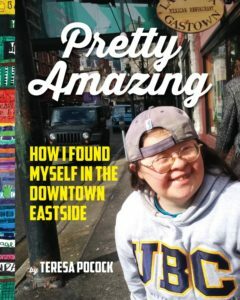 In 2016, Teresa Pocock won a DTES Small Arts Grant to create her first book, Pretty Amazing: How I Found Myself in the Downtown Eastside. The book is now available on Amazon and in Kindle and Apple iBook formats. 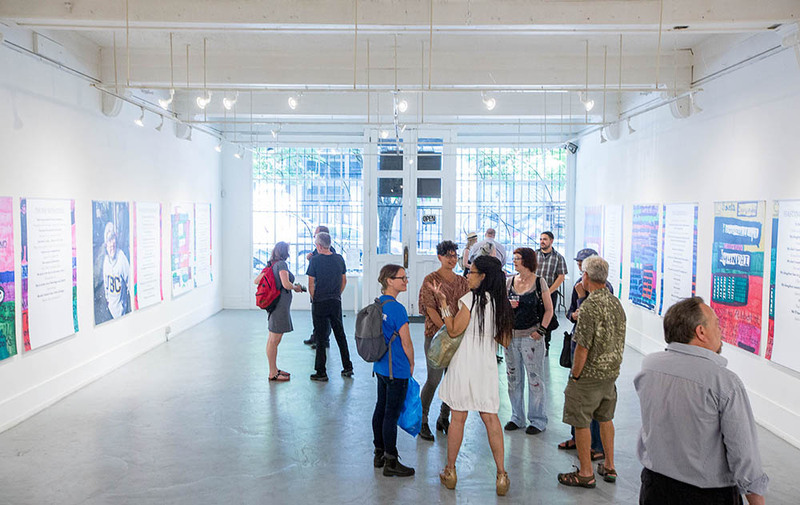 Teresa’s book launch and solo show took place on June 29 at Gallery Gachet, in Vancouver, B.C. 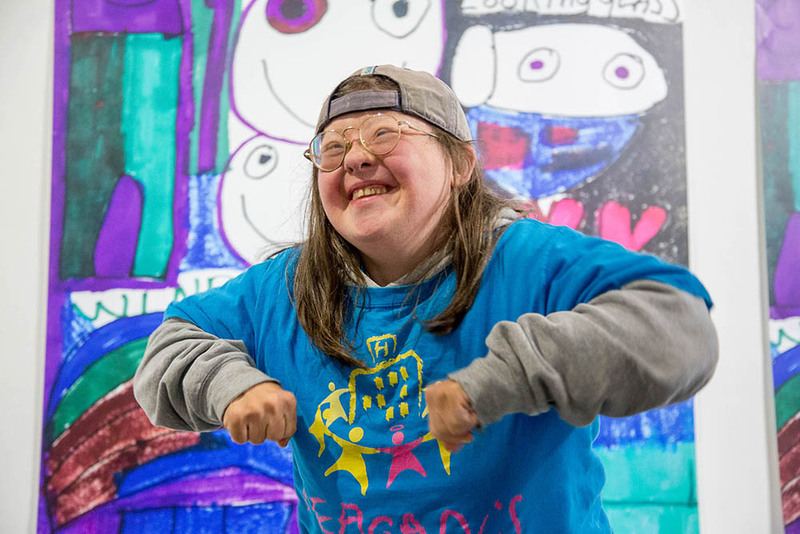 Winning the arts grant inspired Teresa to focus on creating an illustrated book. Before that, she had never created a book. Or exhibited her art. Or shown people her poetry. 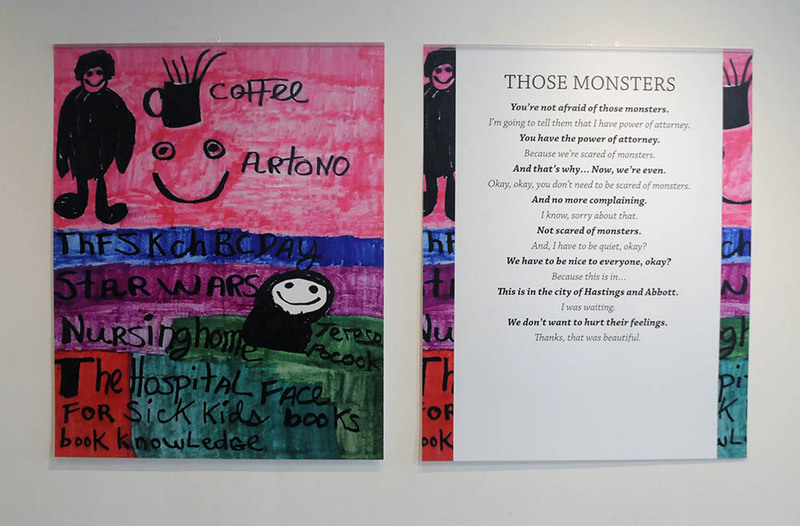 Now, Teresa is a professional artist, poet and published author. Her achievements are impressive for anyone, regardless of I.Q. Her artistic voice is confident and bold. 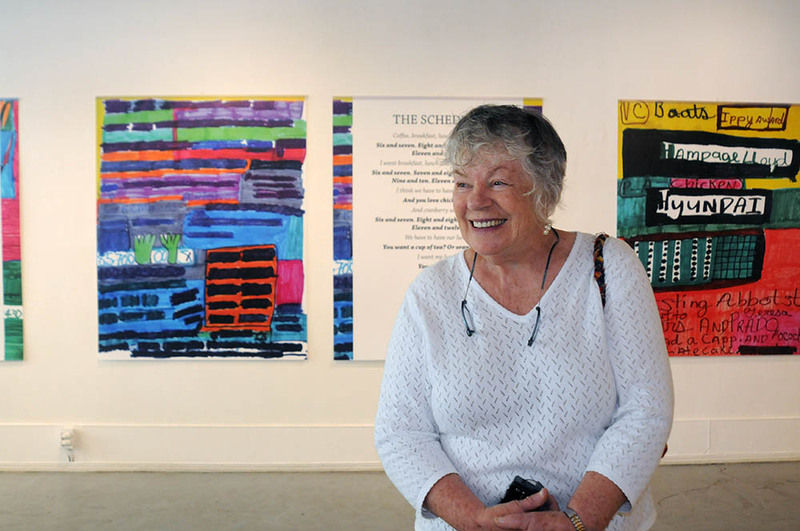 “It’s a wonderful testament to her artistic ability,” said her sister Franke James. “The artwork is fun and engaging. 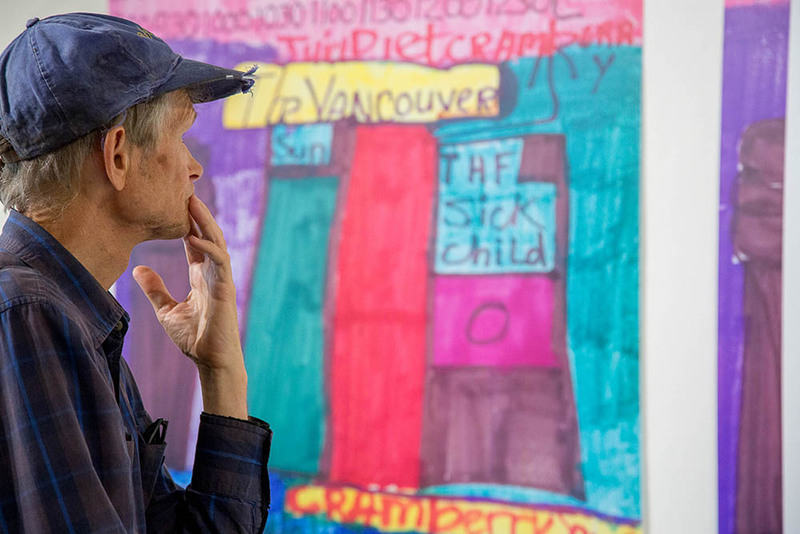 It expresses her discovery of the Downtown Eastside. It expresses a love of her life.” Teresa creates her illustrations using magic markers on fine art paper. The 4ft x 5ft posters are digital reproductions of her art printed on flexible plastic sheets (just like bus shelter posters). 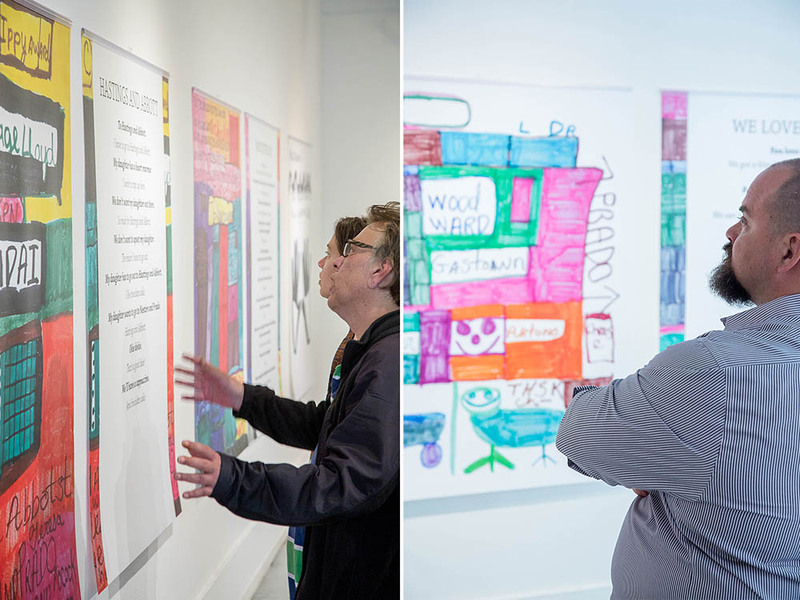 The posters can be rolled and transported anywhere in the world — so she may one day have an international exhibition! 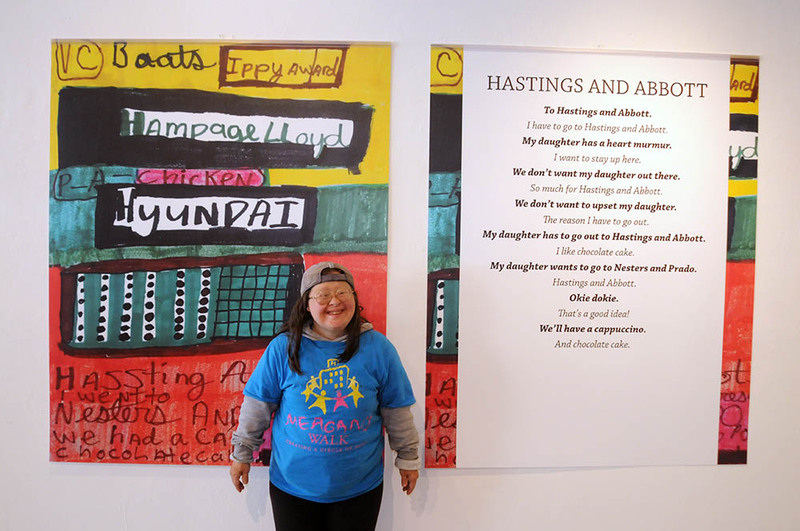 Teresa stands in front of her Hastings and Abbott illustration and poem from her book, “Pretty Amazing: How I Found Myself in the Downtown Eastside“. Teresa has mapped out the neighbourhood as she sees it. Her favourite coffee shop is Prado. She shops for groceries at Nesters and Costco. She loves to visit Gallery Gachet, London Drugs, Top of Vancouver, Woodwards and the Flying Pig. From her home in Gastown, she watches the big cargo ships, like Hanjin, Hapag-Lloyd and Hyundai sailing into the Port of Vancouver. 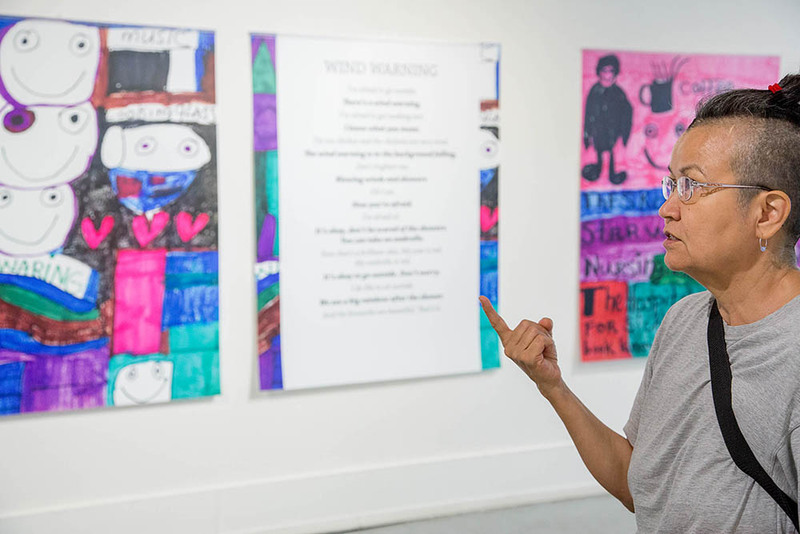 All of these elements combine to create her distinctive visual and poetic vocabulary. Pretty Amazing! The show drew a large and lively crowd. Supporters from Inclusion BC, Spectrum Society, PLAN Institute, the BC Humanist Association, All Bodies Dance, MP Jenny Kwan’s office, the City of Vancouver and Community Living BC all came out to see Teresa’s art. 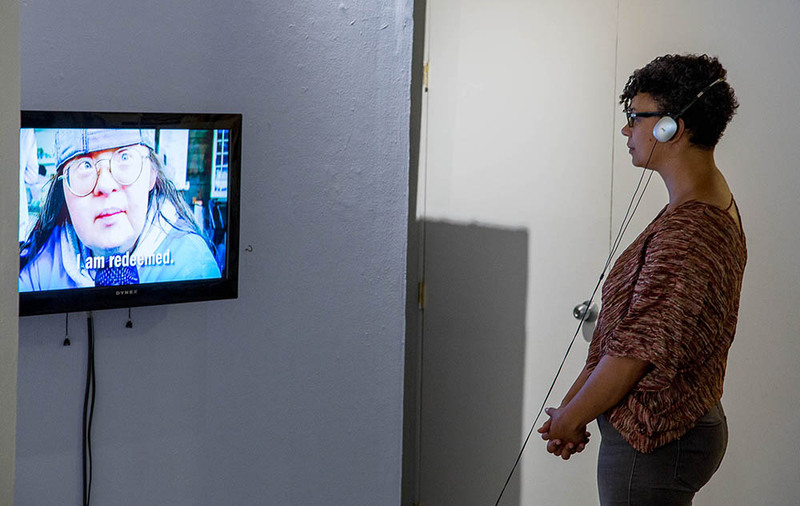 Discovering the Downtown Eastside: Teresa draws inspiration from her surroundings. She can see the Vancouver Sun building and the Harbour Centre from her home in Gastown. Her poems originate from her self-talk. Teresa reads her poems aloud, and continues working on them until she’s happy with them. 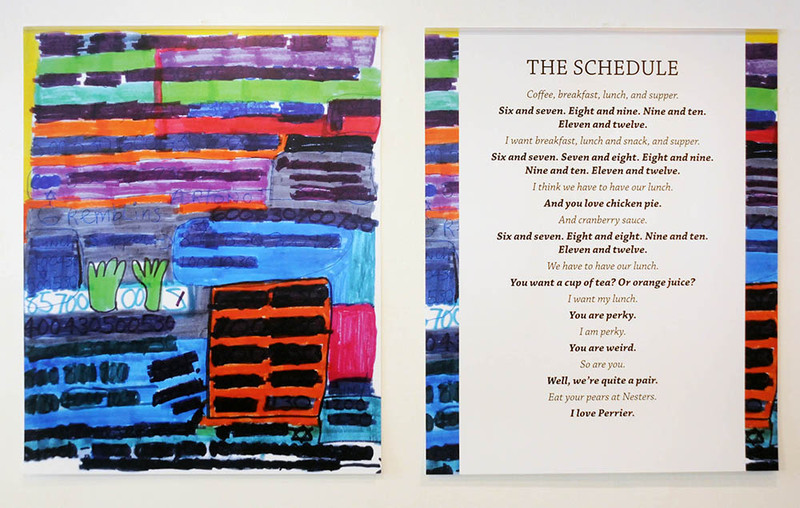 The Schedule is a poem that reveals how Teresa organizes her day. She plans exactly when she’s going to have breakfast, lunch, snack and dinner. Her drawings often incorporate numbers, which represent the times of the day. We hear her sense of humour and wordplay when she writes, “We are quite a pair. eat your pears at Nesters. I love Perrier.” When she recites the poem she laughs at her own cleverness. 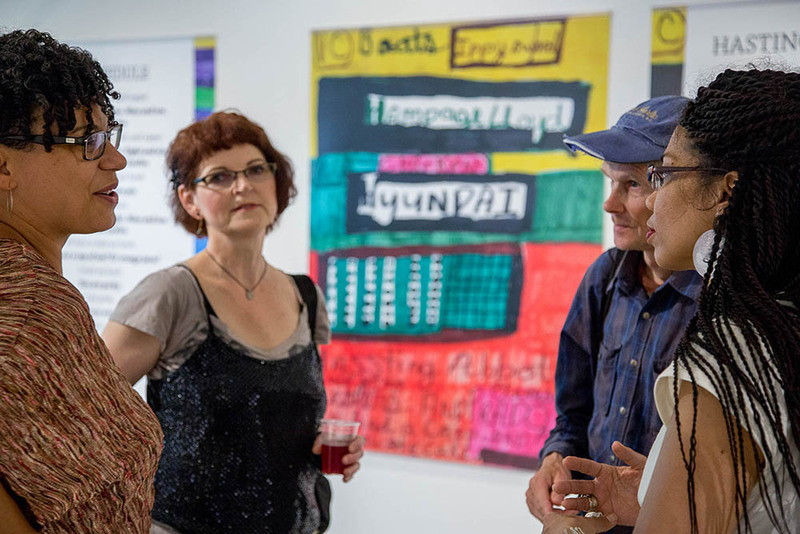 Teresa’s sister, Franke James, speaks with author Ted Kuntz about Teresa’s exuberant art. 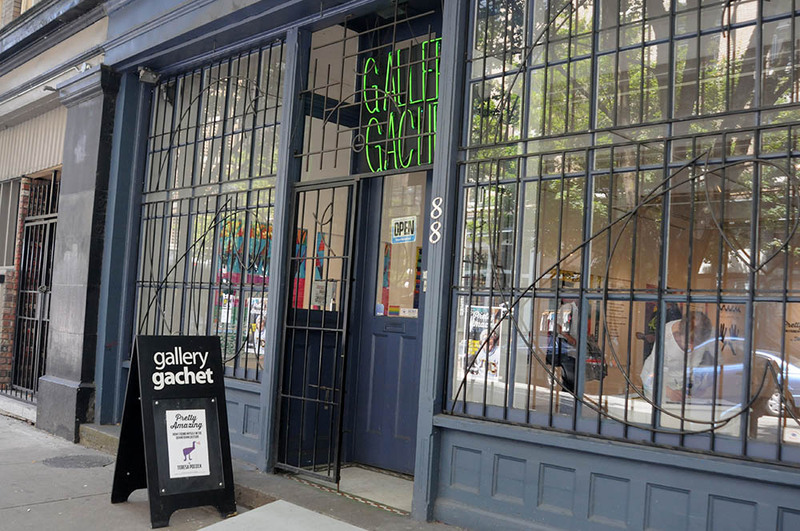 Gallery Gachet says “Art is a means for survival.” They have provided a supportive and very accepting community — exactly what Teresa needed to blossom as an artist and poet. 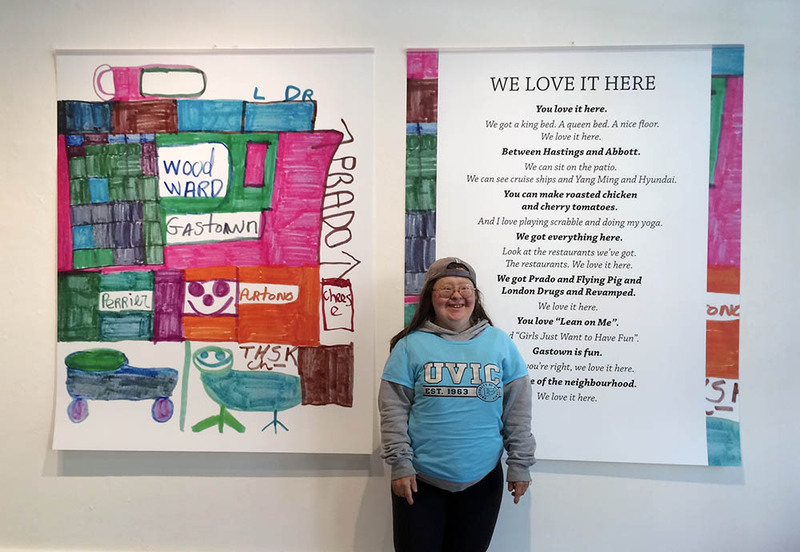 Teresa stands in front of her illustration and poem, “We Love it Here”. A local artist wrote in Teresa’s Pretty Amazing Guest book, “I’ve never seen anything like this!” Others commented on her wonderful use of colour and shape. Teresa has indeed found her voice in the Downtown Eastside. It is a voice that talks about feeling “butterflies”, but still finds the courage to fly. Teresa has, in her own words, been “reborn in Gastown”. 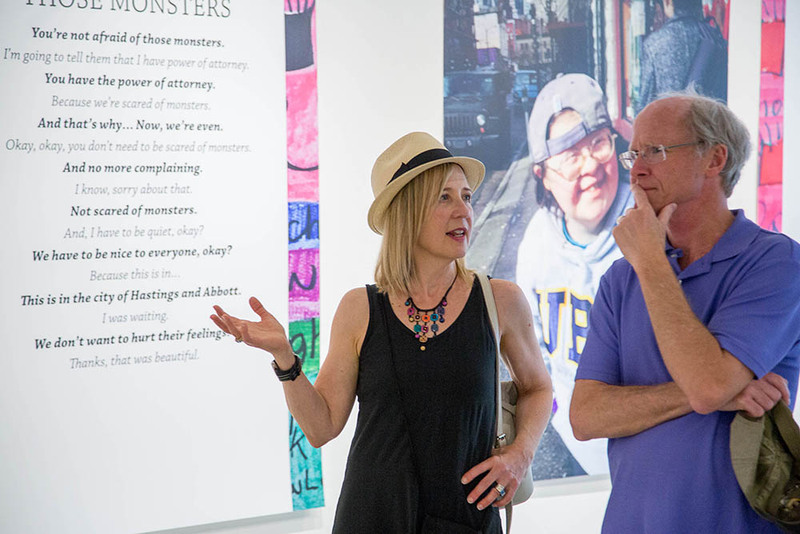 Teresa gives special thanks to the Vancouver Foundation for the DTES Small Arts Grant that made her Pretty Amazing book and show possible! Teresa Pocock is an artist and poet living in the Downtown Eastside of Vancouver. 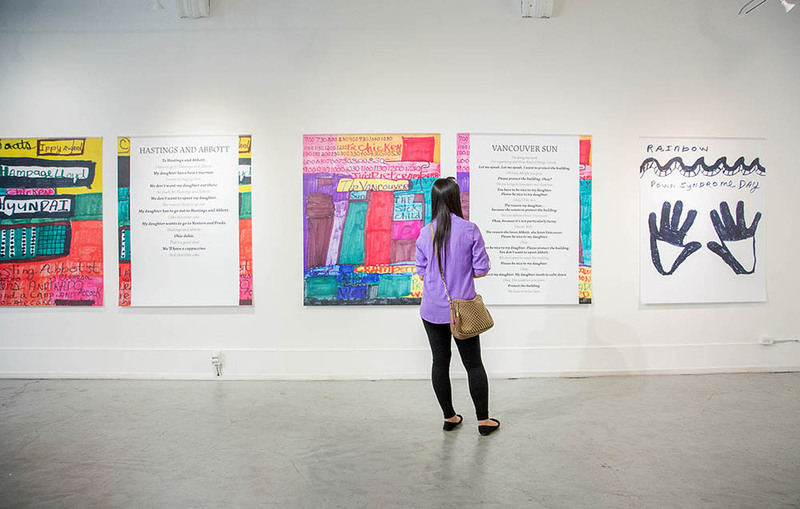 In 2016, she won a DTES Small Arts Grant from the Vancouver Foundation which enabled her to create her first book, Pretty Amazing: How I found myself in the Downtown Eastside. 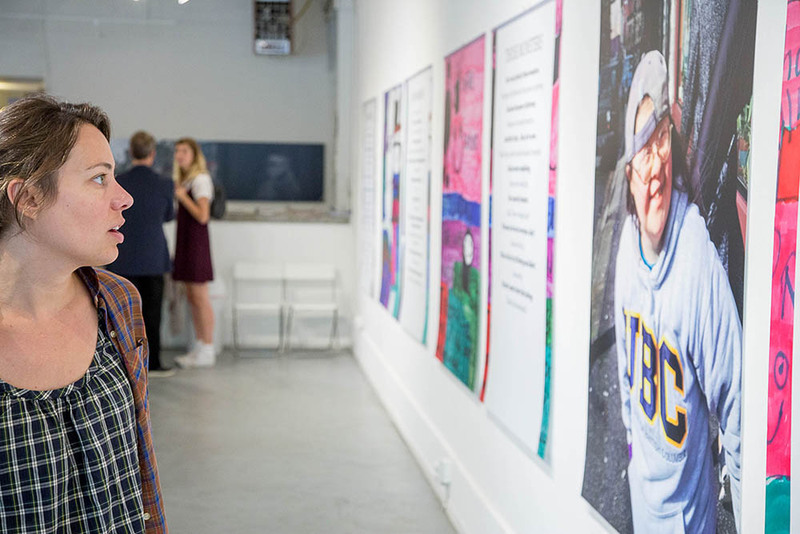 Teresa exhibited 18 “Pretty Amazing” artworks as 4ft x 5ft posters in her first solo show at Gallery Gachet which launched on June 29, and wrapped up on July 2. As a self-advocate with Down syndrome, Teresa presented her story, I Love My Human Rights, at the 2016 Canadian Down Syndrome Conference in Montreal. 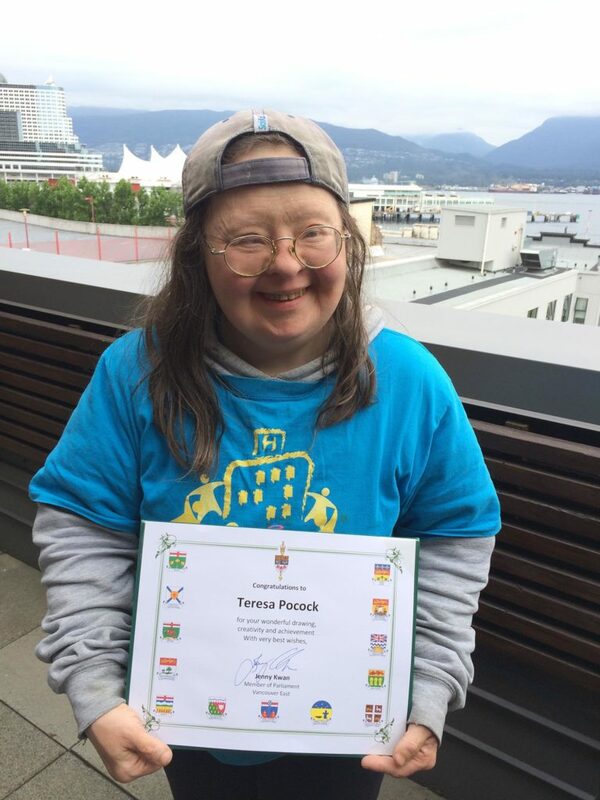 Teresa is a member of the BC Civil Liberties Association, Gallery Gachet, Inclusion BC, Family Support Institute of BC, and the Canadian Down Syndrome Society. She loves chicken pie, word play and spotting the big boats in the Burrard Inlet. Pretty Amazing: How I Found Myself in the Downtown Eastside is available on Amazon and in Kindle and Apple iBook formats.